Ted Junko, a part-time instructor of industrial and interaction design (IID) in the College of Visual and Performing Arts’ Department of Design, won a bronze International Design Excellence Award (IDEA) from the Industrial Designers Society of America (IDSA). 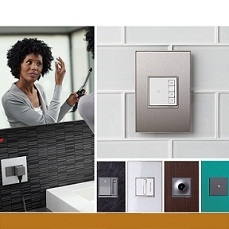 Junko, who is also a 1984 alumnus of the IID program, was part of the team that won for “the adorne collection: switches, dimmers, lighting controls & outlets” in the 2013 IDEA bathrooms, spas and wellness category. Started in 1980 by IDSA, the IDEA program fosters business and public understanding about the impact of design excellence on the quality of life and the economy. Out of 687 finalists in this year’s competition, 27 were honored with a gold IDEA, while 45 received a silver and 106 merited a bronze.